With his first jump in 1973, FlyinBob, D-5526, is the old-bones (some would say "fossil") of the TWA instructors. A lifetime member of USPA, he has had training or certification during his jumping career as a Jumpmaster, Skydive University Coach, and Wingsuit Instructor. With over 1500 jumps, FlyinBob has made more than 500 wingsuit flights, in groups as large as 50 flyers, in the US and Puerto Rico, in about a dozen different types of wingsuits. FlyinBob started jumping while still in college at the University of Maryland, earned his USPA A, C, and D licenses plus his SCS within 3 years, and made about 500 jumps all over the US from Pennsylvania to Florida to California and Hawaii, and also in The Netherlands and Japan before starting a family and a career in the high tech industry, returning to graduate school, and retiring from the DZ life. After a 20 year layoff from skydiving, when his daughter turned 18 and wanted to skydive (see photo gallery), FlyinBob recertified and made another 1000+ jumps. On November 26, 2003, he discovered wingsuiting when Tamer Baker from Florida came through some Texas DZ's with demo wingsuits. 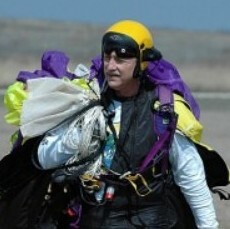 From that very first flight, FlyinBob was hooked on wingsuits! More flight than fall!! Doubles your jump dollar!! With Ted Cheslek (Professor) and Jason Weisberg (Voodew), he learned to fly and flock mostly from Cessnas at Skydive Temple. He achieved the Phoenix-Fly Instructor rating in 2006, and has participated in wingsuit events at Z-Hills, Puerto Rico, and Moab, as well as several in Texas.